On 18 January 2016, the first completed component for the WEAVE project, the handling trolley, arrived at the WHT (below). The trolley was manufactured in Barcelona according to a design by the Spanish company SENER and was completed in December 2015. It was procured by the IAC, with funding from the ERDF (European Regional Development Fund). 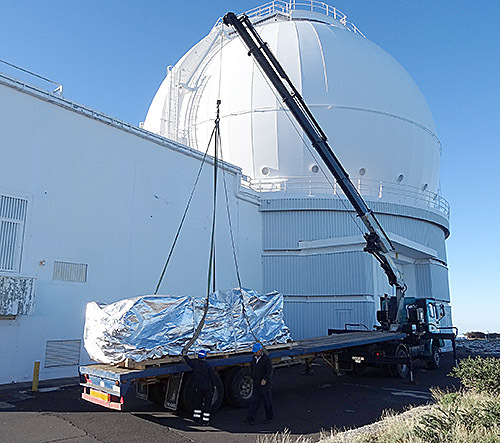 The trolley will be used for assembly and integration, and to store the WHT top-end unit (new 2-deg corrector, plus WEAVE fibre-positioner) when off the telescope. With most of the final-design reviews for WEAVE now completed, construction of all the other components of WEAVE (new prime-focus corrector, fibre-positioning system, fibre bundles and spectrograph) is proceeding in parallel, with the project on schedule for first light in early 2018.